The gyms here are nothing like the standard of the gyms back home and they are EXPENSIVE as well. Basically you need to be content with a few cardio machines and some weights, or you can pay the big bucks and go to the Klab gym which has Turkish Baths and endless extras. At FlorenceForFun we are happy to be on the treadmill, that the weight machines are of a good standard, and that the facilties are clean and functional. 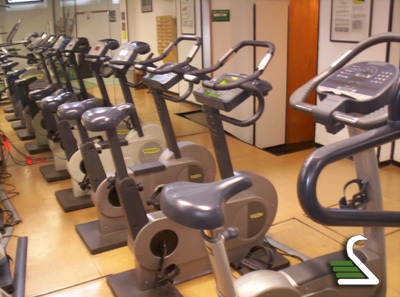 We like going to Swan Gym, which is located on Via dei Pepi in the Santa Croce area. The best deal is the 3 month membership. If you go to the gym 3 times a week for the duration of your membership, it’s only €3.50 per day. That’s an affordable price tag! Being constantly surrounded by the traffic and congestion of the city can seriously mess with your zen. That’s why we suggest hitting up 19R Yoga & Pilates. Just a few minutes away from the Ponte Vecchio, the teachers are all incredibly nice and helpful, and classes are taught in both English and Italian and tailored to the level of the participants in the class. Practicing 90 minutes of yoga a few times a week will help strengthen your muscles, blast away calories, and help keep you mellow and happy during your study abroad semester. Students can buy a 2 month unlimited pass for 99 euro. If you go twice a week, that’s only 6 euro per class! Check out their class schedule at http://19ryogapilates.com/. Save your favorite workout dvds onto your laptop and buy a yoga mat when you get here. You will save a lot of money and time if you are happy to do your workouts at home. In the main square in Florence, Piazza Duomo, there is a sports store which has sneakers, workout clothing, weights, yoga mats, and other equipment. For around €6 you can buy a yoga mat, fill a couple water bottles to use as weights, and work off those pasta pounds at home. We like Jillian Michael’s 30-Day Shred, which you can watch for free on YouTube. Florence will be HOT when you arrive in September, but it will also be daylight until relatively late in the evening so you can wait until it cools down before you head out. If you are looking for somewhere flat to go running you can head along the river in either direction along the bike paths. For those of you looking for a challenge along with an amazing view of Florence, head up to Piazzale Michelangelo. Buy fresh produce from the markets and cook at home. Restaurant food might be more appealing, but they generally put in twice the amount of butter and oil than you would use if you cooked the same meal at home. Fruits and vegetables in Florence are all cheap and incredibly fresh, and can be picked up at virtually any outdoor market (in the mornings) or supermarket. Check out the FlorenceForFun Recipe of the Week for some budget-friendly weeknight dinner ideas.